In the first runoff debate, Mayor Rahm Emanuel conceded that Chicago struggles with economic disparity. But he argued that "it is a false choice to pit one part of the city of Chicago against another." Since Emanuel took office, though, the city's primary economic development tool is doing just that—favoring gentrifying neighborhoods downtown over the rest of the city. Nearly half of the $1.3 billion in tax increment financing funds allocated by Mayor Emanuel since 2011 have gone to the Loop and surrounding areas, according to city records. It was much the same five years ago, when we examined the TIF program under former mayor Richard M. Daley. As a candidate for mayor in 2011, Emanuel promised to make it more fair. But about 48 percent of what he has committed to spend in TIF funds over the last four years has gone to these same favored communities, an area stretching roughly from the Gold Coast on the north to McCormick Place on the south and from the United Center on the west to the lake. Those neighborhoods account for about 5 percent of Chicago's geographical area and 11 percent of its population. 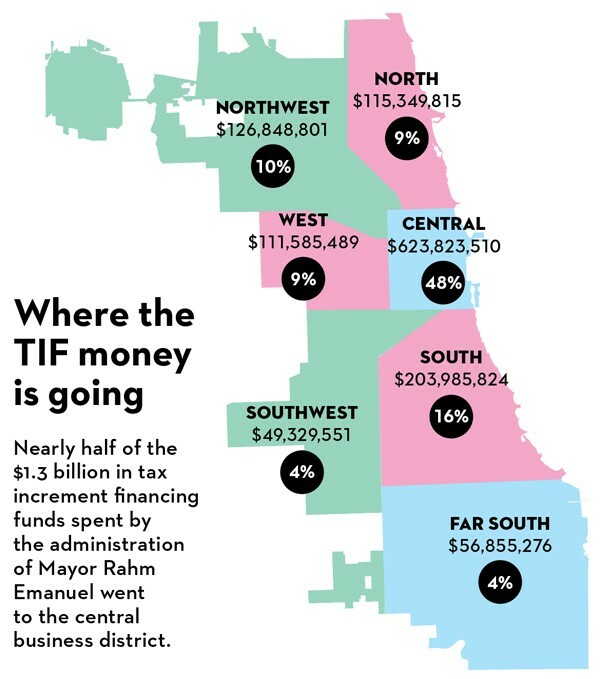 In contrast, the south side received about 16 percent of the TIF haul, the northwest side 10 percent, the north side 9 percent, the west side 9 percent, the southwest side 4 percent, and the far south side—which includes some of the city's poorest neighborhoods—just 4 percent. Even some of the mayor's council allies say it's time to change the TIF program so that more resources go to struggling neighborhoods. "Would I be much happier if I could get some of those dollars? Absolutely," says Alderman Willie Cochran (20th). "Do the regulations have to change? I would be in favor of it." The TIF program was created to eradicate blight by subsidizing development in communities that would not be developed "but for" the assistance. The irony, as Cochran points out, is that it's governed by a formula that collects more money for rapidly gentrifying communities than anywhere else, including the city's poorest, most blighted areas. When the mayor and the City Council create a TIF district, they basically limit the amount of property taxes within that district that go to the schools, parks, county, and other taxing bodies. As property values rise, the increased property tax yield flows into a TIF account controlled by the mayor. That means a community undergoing rapid gentrification—like the area around McCormick Place—will have more money flowing into its TIF coffers than poor communities like Woodlawn, which Alderman Cochran represents. Under state law, the city has little ability to move the funds from one part of town to the other. In essence, the TIF program is like a competition for a limited amount of money. But it's not a fair fight—it's more like a 100-yard dash in which one guy starts at the 50 and everyone else is trying in vain to catch up. For instance, Mayor Emanuel approved spending $87 million in the LaSalle/Central TIF district in the Loop—and nothing at all in the 126th/Torrence district on the southeast side. In fact, no money was spent in 23 of the 149 TIF districts across the city. And more than half of the city isn't in a TIF district, which means those excluded areas don't receive any investment from the program either. In the last decade, Mayor Daley often dipped into the TIF pot to convince corporations to move or stay downtown. Early in his tenure, Emanuel continued that practice by giving $6.5 million to induce Sara Lee to move to the West Loop from Downers Grove. The largest for-profit beneficiary of TIF money under Mayor Emanuel is the Marriott Corporation. The mayor got the City Council to earmark $55 million in TIF money to buy the land at Cermak and Prairie where a new Marriott hotel will be constructed as part of the larger DePaul basketball arena project. As Emanuel often points out, he has changed part of the TIF program by slowing the pace of controversial subsidies to corporations. He says he's using most of the TIF money to fund pressing infrastructure needs. But again, because of the inherent flaws in the program, there's a vast disparity in who gets what for traffic lights, new streets, and CTA stops. The River South TIF district, for example, received $51 million for street improvements and $9 million for CTA track repairs in the last four years. In contrast, the West Woodlawn TIF district—in Alderman Cochran's ward—got no money for street improvement or train work. But it did get $1.3 million for new lighting. That's exactly $1.3 million more than the far-south-side district of Roseland got for new lighting, which is nothing. The point is that the TIF money is not being equally distributed. The inequities stretch beyond poor south- and west-side TIF districts. Even middle-class communities on the north side lag behind the Loop in TIF-funded investment. In the Lincoln Avenue TIF district, for instance, just $300,000 was spent on street improvements and nothing on CTA work. In truth, the mayor's CTA appointees cut service on the Lincoln Avenue bus. Sometimes the inequities are obvious even within the same communities. On the northwest side, the mayor is spending $1 million for street improvements along Elston Avenue. However, there's almost no money for a nearby stretch of Milwaukee Avenue, where "the streetlights are ready to fall over," says Alderman John Arena (45th). "The city doesn't have the money for it, and there's no TIF there." The mayor also says he's proud of using TIF money to pay for school construction. But only 8 percent—or roughly $105 million—of TIF spending under Emanuel went toward school projects. That's far less than the roughly $900 million in property taxes that could have gone to the public schools over the last four years if the TIF districts weren't collecting the money. The big winner in the school funding game is Jones College Prep. The South Loop selective enrollment school is receiving $15.6 million for a new sports field as well as $9.3 million to renovate part of its old building. Mayoral challenger Jesus "Chuy" Garcia has proposed that the city close TIF districts in and around the Loop, which would allow those property tax dollars to be used for citywide operational expenses and pension payments. Emanuel says he's open to using some surplus TIF money for pensions. But he opposes closing downtown TIFs on the grounds that the city needs that money for infrastructure. "Almost 75 percent of TIF resources are used for schools, libraries, parks, transportation, and neighborhood improvements," he says. But under the mayor's TIF program far too many neighborhoods are still not being improved. With the Willis Tower and other downtown buildings fetching record sales prices, it's a good time to remember how much TIF money we've sunk into these areas. Will the next schools chief please stand up—to Rahm? Barbara Byrd-Bennett steps down after overseeing school cuts and closings. Another day, another TIF dispute, but the fact remains: 48 percent of the money is going to just 5 percent of the city. Chicago remains a deeply divided city. Don't we need a uniter more than we need a tough guy? Racial segregation continues to inflict wounds on the south and west sides. And once again it's ignored on the campaign trail. Alderman Willie Cochran, a former police officer, says it's time for an infusion of money, opportunities, health care, and police in violence-ravaged neighborhoods.